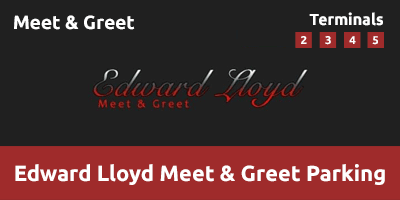 If you’re flying from Heathrow Airport and looking for the ultimate in airport parking, look no further than Edward Lloyd Meet & Greet. With this arrive-and-fly service, you’ll be checking in for your flight in no time at all. This Park Mark Safer Parking Award-holding service is perfect for those travelling with young children, heavy bags or just wanting to start their holiday as soon as possible. Transfers are not required for this service. Drivers all fully insured to drive your vehicle to and from the compound. The car park features CCTV and security fencing and has been awarded the Park Mark Safer Parking Award - giving you peace of mind while you're away. This is the ideal parking solution for customers who may require any extra assistance. Operating times are 05:30 until 22:30. Edward Lloyd Parking will not be able to take your car if it is not legal or is in any other way unsafe to drive, such as tyre tread not within the legal limit. Please call when you are approximately 30 minutes away from the Terminal. Please follow signs for Terminal 2, as you approach the ramp stay in the far right hand lane, follow signs for Level 4. Take a ticket at the barrier and drive round to Row B. Follow signs for Departures, enter the Short-Stay Car-Park and proceed to Level 4, Row B. This is where the driver will meet you. Follow signs for Departures, stay in the left-lane as you drive up towards Departures, there are three drop-off lanes outside Departures, please park in Lane A, which is the furthest lane away from the building - your car will be collected from there. Follow signs for SHORT-STAY PASSENGER PICK-UP, that will take you towards the car parks, then follow far left lane for LEVEL 4. Follow LEVEL 4 into the car park, then drive round to ROW S - your car will be collected from there. Once you have met the driver he will inspect your car with you for any existing damage. Edward Lloyd will then confirm your return details. Your car will then be driven to a secure compound. Please make sure when returning from an overnight long-haul flight that you enter the correct date you land in the UK. It is advised that you save the mobile number to your phone to avoid difficulty in calling us when you are on the way to the airport. You will then be asked to make your way to the same place you dropped the vehicle off, Level 4, Rows A & B. You will then be asked to make your way to the SHORT-STAY CAR PARK 3, LEVEL 4, where your car will be returned to you. You will then be asked to look for the WHSmith in the Arrivals Hall, once you get to WHSmith, exit the building and walk into the Short Stay Car Park. Once in the car park take the lifts to LEVEL 2, then exit the lifts, turn to the left and your car will be there. You will then be asked to make your way to SHORT-STAY car park LEVEL 4, ROW S, this is the same place you dropped your vehicle off.